The rolling tundra is not hard to negotiate, and combined with the use of boats, allows us to tailor a hunt to an individual’s preferences or physical ability. We offer hunters the chance at harvesting a bull with rifle, bow or muzzleloader. Although our terrain is mainly tundra, it still offers excellent cover in terms of small stands of spruce, dwarf birch, outcroppings of rocks and natural ridges that enable a hunter to not only wait for the animals to come to them, but also lends to a “spot and stalk strategy” for that monster bull of a lifetime. Each of our camps take only 8 hunters per week, so its always best to call and book early. Sadly, the number of tags we as outfitters get each year seems to be dwindling. We have also experienced some “off years” where the migration wasn’t as predictable as it has been in the past. With that said, we stay committed to doing everything in our power to get our hunters in front of caribou. This might mean moving camp locations, flying in and setting up boats on adjacent lakes, or doing reconnaissant flying to locate groups or herds of caribou. This all sounds pretty easy, but in fact it can also prove to be very difficult. We are happy to discuss this situation in detail for those that wish. The good news…. A recent full aerial “calving grounds survey” conducted in 2017 indicated the Qamanirjuaq Caribou herd has been stable at roughly 285,000 since the last survey was completed in 2014. 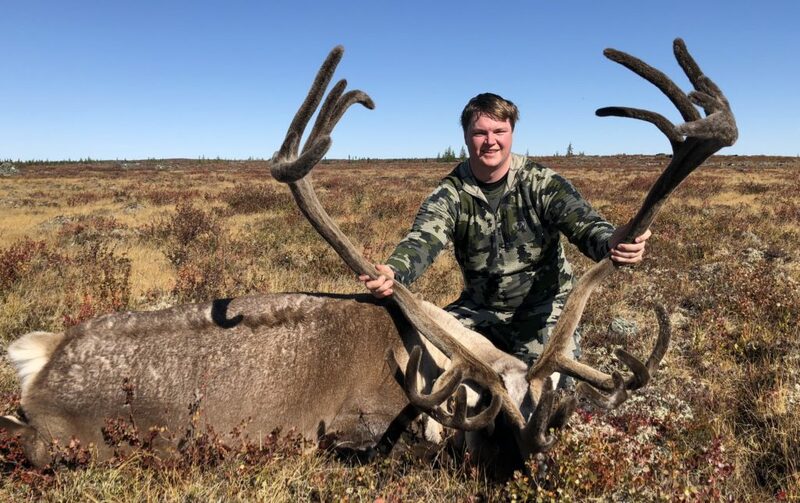 Although this number is down from the highs of over 400,000 in the late 1990’s and early 2000’s, we’ve been told these numbers still remain in the range of the mortality cycle with this particular caribou herd. The Qamanirjuaq Caribou Herd is still considered by all to be one of the healthiest herds found anywhere on the planet. That said, there is unfortunately still the expectation out there with some hunters that all you have to do is show up and take your pick of the animal you want hanging over your fireplace. Although this is definitely sometimes the case, we don’t over-predict your potential success based on that scenario. Hunters still have to go out and hunt, and nothing is taken for granted. Hunting is still hunting, even when hunting an animal that has such high population numbers. 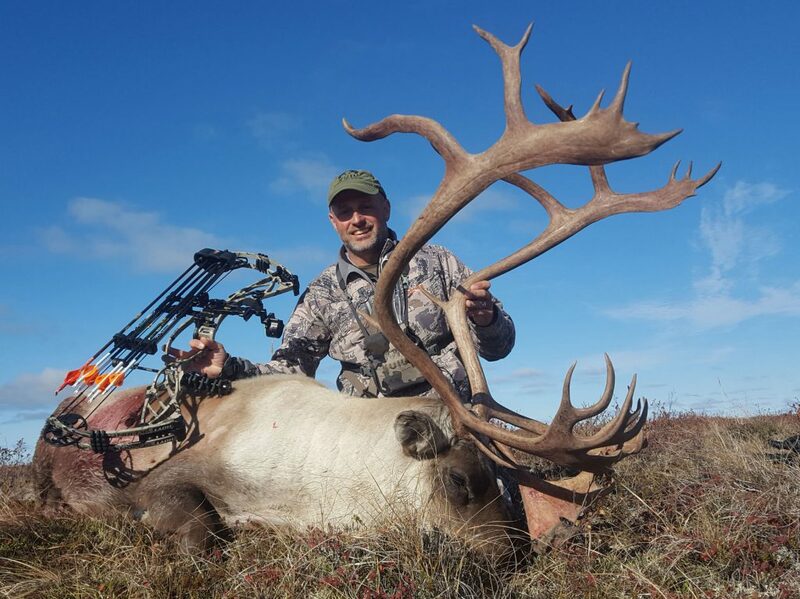 We hope that we have the opportunity to discuss one of our caribou hunts with you. We definitely think you’ll have a trip of a lifetime!! Fishing is included with all hunting packages, all you have to do is purchase a license for a minimal amount. Did you know, we can also combine a Wolf and/or a Wolverine with any caribou hunt? Give us a call or send us an email. We try to be available anytime to talk about what we love to do best, and that’s hunt and fish!! A deposit equaling 50% of your total package price is due within 14 days of booking. Bookings will not be considered complete until the deposit is received. Deposits are non-refundable and non-transferable (except as noted under “Cancellation Policy”). All remaining balances are due in full 90 days prior to your hunt date, the year of your trip (the “Trip Start Date”). If you are booking a year or more in advance, a minimum deposit of $2,000.00 is due within 14 days of booking. On January 1 of the year of the Trip Start Date, the remainder of the 50% deposit must be paid. The remaining balance (50%) of the total package price is due in full 90 days prior to the Trip Start Date. If you are booking fewer than 90 days prior to the Trip Start Date, full payment of the total package price is due upon booking. Payments can be made by Visa or Master Card (a 3% surcharge applies to credit card payments), wire transfer (extra fees might apply), cheque or money order. Special Note: Due to our new arrangements on this hunt, hunters will be extremely limited as to how much meat they can take home. Only backstraps and tenderloins may be taken by the hunter. The remainder of the meat will be sent to Northern communities in need. Once an animal is wounded, every effort will be made to recover that animal. Regardless of the outcome, the tag will be considered filled for that animal.